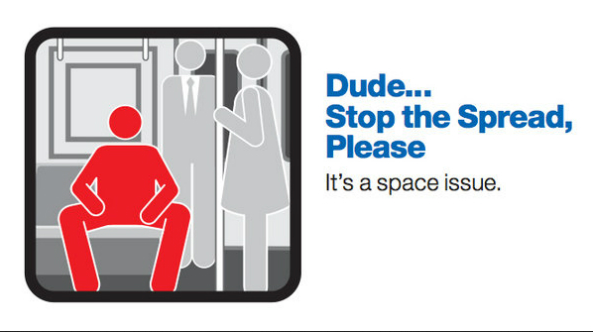 Public Transport MTA:Manspreading, Primping, Just keep your stuff to yourself on the Subway OK? While the weather looks set to turn rather chilly, New Yorkers will probably be better off staying in, although it has to be said NYC is pretty good about still getting around with many feet of snow having fallen,- just read here- as opposed to London having just a few inches. (it can stop the whole city-no joke). In a city of so many and overcrowded subways it makes sense. It's always infuriating when you get on public transport and someone has given their bag a seat, their make up, or someone's spread their legs so wide they take up three seats- this is easier to do on the NYC subway than the London Underground, because the seats are injection moulded plastic, rather than the padded seats with arm seperators on the London Tube. 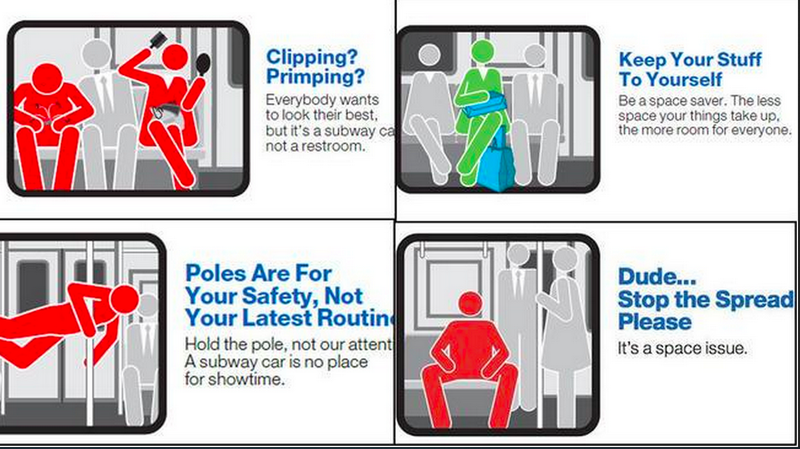 But some of the MTA language is hilarious, (in a British way, we laugh when we see outright rudeness, it's shock or something) bordering on what we in the UK might see as offensive "Poles are for your safety not for your latest routine" I mean they seriously dont mince their words. They remind the women this is a "subway car not a restroom" and about that bag taking a seat, they are equally direct and abrasive "Keep your stuff to yourself". This is the New Yorker way, this city isn't run on it's politeness. In stark contrast to the way Transport for London (TfL) asked Londoners in 2013 not to run and take their time in terms of "what wouldn't hurt you" read here. What is the man in the red doing on the Clipping/Primping picture? The mind boggles. So to remind NYC public transportation users to have consideration for others you can see posters like this emerging on the Subway, and London Underground users want London to do something similar. Isn't it a strange world when posters have to encourage you to behave and have some manners, I wish someone would tell my noisy neighbors, maybe I'll just make a poster. So, no doubt you've followed the wonderful people of NYC coming out and protesting for the preservation of the enviroment just a few weeks ago, well another ecological concern was what to do about horses being used in the center of a busy polluted city. So how ecological is a horse drawn carriage ride through the magnificent Central Park? Opinion was divided when Bloomberg, the city's then mayor decided to take horses out of the equation. Some in favour of getting rid of the horse rides used the argument that many of these horses were tired, weren't treated well, and hey wasnt this 2014? shouldn't we stop using animals for our own entertainment in this pollution- shouldn't horses be free to do what horses do? Some in favour for keeping the horse rides because it was traditional, it is something that's been going on for years of course and the horses are confined to a non-car environment path in the park. Given that the horses used are the ones best suited to this type of work and unable to do heavier labor some said the horses would be slaughterd, and this was more cruel, effectively stopping the horse drawn carriage rides, would end the horses lives. Whatever your opinion on these issues, they have gone. But the creative people at"Creative Workshops" in Dana Beach, Florida have come up with a environmentally friendly alternative. The horseless E-Carriage! 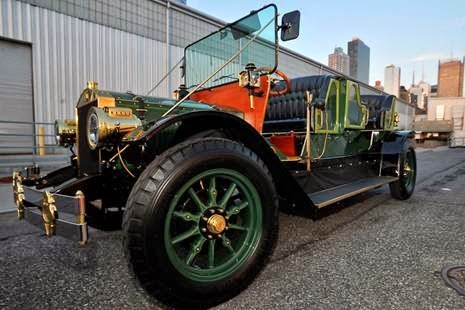 based on the original carriage from 1911 the clever engineering folk in Florida have created an almost exact replica, only this time the car is electronic, and so less of those harmful pollutants, while still keeping the horses free from the labour. It's had a day in NYC, take a look at it next to central park below and follow updates on their FB page, they have all the history to the cars and engineering process it took to get here on there as well as other fab pictures and video, they're also doing one for Arizona. Inspired NYC, A blog journal of Londoner in NYC for a year. Freedom to Create, Empowering Women Art Exhibiton. Hina Pandya-this site is copyright protected-to use words or images contact me first. Picture Window theme. Powered by Blogger.